The extraordinary design of Axor Starck Organic, designed by Phillipe Starck, shows itself in an organic composition, from which nature served as a model. The flowing transitions between body and handle underline the natural character, as the elements appear to be in one piece. 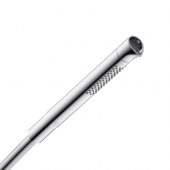 In addition to the design, this product line is also characterized by its exceptional and innovative operation: the temperature is set on a rotary handle at the upper end, the water volume is set directly on a second rotary handle on the water outlet. 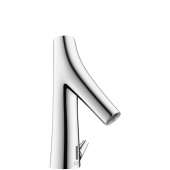 Due to the water-saving feature of Starck Organic faucets, the line has already received the Green Product Design Award. The washbasin faucets of the product line Starck Organic are available in a single or double handle version and have a projection of 187 mm. Flexibility is ensured by the various heights available and the fact that the faucets are available in a stand as well as in a wall version. 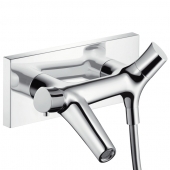 The single-lever mixers are available in heights of 240 mm, 280 mm, 365 mm or 435 mm for a countertop wash basin. The spray jet creates a special pleasant feeling when washing your hands. Especially with the two-handle faucet, the reference to nature becomes visible: it is reminiscent of the branch of a tree. 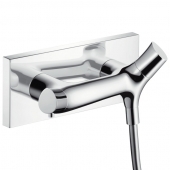 The Starck Organic line also has electronic faucets. These are battery-operated and have a battery life of about two years. Hygienic rinsing (automatic water flow for ten seconds every 24 hours after last use) and thermal disinfection (water flow for 180 seconds) to ensure the necessary hygiene in the faucet. The organic look is also retained in the shower faucets. The faucet is mounted horizontally on a rosette and brings nature into the shower. This is reinforced by the handles, which are designed like natural drops of water. The shower thermostat has a safety lock at 40°C to prevent accidental scalding. 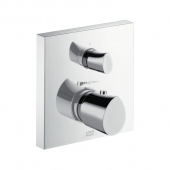 The product line also includes individual thermostat modules and single-lever shower mixers, so that an individual combination of shower faucets is also possible. 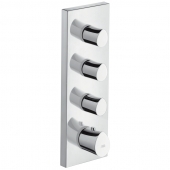 Even if you are looking for a complete shower set, you will find it at Starck Organic: the line offers several sets with shower hose, holder and hand shower. This also shows up with the characteristic teardrop shape at the upper end. All that is needed to have a complete shower faucet is only a thermostat or a mixer. The eye-catcher for free-standing bathtubs is undoubtedly the floor-standing bath mixer. 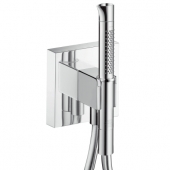 This has an integrated hand shower with holder, shower hose and safety lock at 40°C. 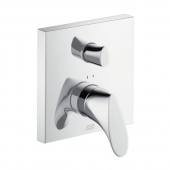 The range also includes a single-lever bath mixer for in-wall mounting installation, a bath thermostat for surface mounting, a two-hole bath thermostat, a single outlet and a thermostat, which is mounted horizontally on a rosette and can be used by two consumers. 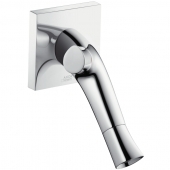 The range of bath faucets is completed by a four-hole tile mounted mixer with spout and hand shower, which can be extended up to 1.10 m. The spout is similar to the washbasin faucets and the levers are drop-shaped. 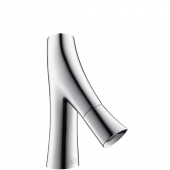 The bidet faucet of Starck Organic also resembles a tree with an outstanding branch. 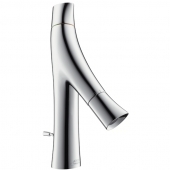 The front spout is drop-shaped downwards and forms a normal jet. As it is typical for the series, temperature and water intensity can be controlled separately.